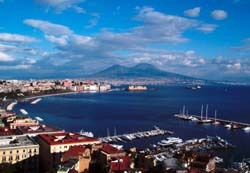 The presented room availability, rates and discounts are actual and final for all our 320 hotels in Napoli. Travelers giving preference to a taxi cruising of the city should better call a taxi by phone or take a car from special taxi parking lots which are located in close vicinity to all significant landmarks and entertaining centers. On holidays and weekends from 2 00 till 00 a taxi service will cost a bit more than usually. Major part of spots of tourist attraction is located in the historical part of the city which is better to be explored on foot as in this case travelers will have a chance to fully embrace the majesty of the historical landmarks of Naples. Some streets of the historical area of the city are banned for city transport and cars. Numerous rental centers of Naples offer various cars for rent. To rent a car one will need international driving license and international credit card with enough limit to cover the rent. The highest rates are offered in rental centers located in close vicinity to the hotel or directly on the hotel premises. Payments in shops, restaurants and cafes should be made in national currency only as any other currency of the world may not be accepted. The currency should better be changed before a journey as in this case one will find the most profitable exchange rates. Exchanging the currency in Naples, one should give preference to banks as private currency exchange offices will charge large transaction fees. Gastronomy tourism fans should pay special attention to local pizza houses which are justly considered to be the best ones in Italy. All the restaurants and cafes welcome tips. A cash reward of 10 – 15% of total bill will be quite enough.